A fun science project that can be performed at home requires a quick run through the laundry room or kitchen to gather supplies. Using a high power biological microscope and slides, many of the following items can be viewed on a wet mount slide, or as a dry mount slide. Notice how the same item looks different under the microscope when it is dry versus when it is saturated with water. Try viewing the following items under the microscope. Start at the lowest magnification, get the items in focus, then move up to higher magnifications. 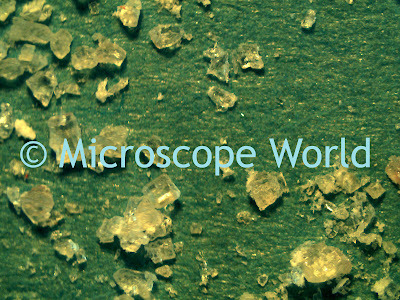 Sugar crystals under the microscope.